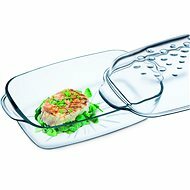 You will always achieve perfect results with the high- quality Lamart LT 3006 glass pan, which is made of a very durable SIMAX glass. This amazing material belongs to a group of clear and hard glass that is resistant to temperatures from -40°C up to 300°C. 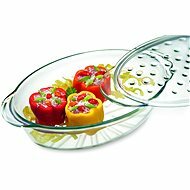 Both the pan and the practical glass lid are transparent, so it is possible to continuously check the condition of the preparation of the dishes. The pan offers a capacity up to 2.4 litres, which is enough space for roasting meat, fish and a large number of different side dishes. Lamart can be used for baking both in a conventional oven and microwave oven, and can also be safely stored in a refrigerator or a freezer. You will also enjoy very simple cleaning maintenance. In addition, the pan can be comfortably washed in the dishwasher after use.The 10-year warranty only makes the product more impressive. 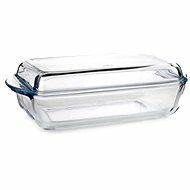 For shipping to other EU countries visit this page Lamart Glass Pan with Lid 2.4l Delica LT3006. Für Versand nach Deutschland, besuchen Sie bitte Lamart Auflaufform mit Deckel 2.4 Liter Delica LT3006. Chcete doručit zboží do Česka? Prohlédněte si Lamart Skleněný pekáč s víkem 2.4l Delica LT3006. Chcete doručiť tovar na Slovensko? Prezrite si Lamart Sklenený pekáč s vekom 2,4 l Delica LT3006. Für Versand nach Österreich, besuchen Sie bitte Lamart Auflaufform mit Deckel 2.4 Liter Delica LT3006. Magyarországra történő kiszállításért tekintse meg ezt a termékoldalt: LAMART LT 3006.